South Africa travels: The Wine Tram! One of the best things about living in South Africa is being able to drink the country’s wine freely and cheaply (within reason – we try and limit our imbibement to weekends!). But of course, one problem is that children don’t tend to be very into wine – and when you have an 8yr old and a 10yr old like we do that does somewhat limit your ability to explore the wondeful wine regions. However where there is a will there’s a way and last week I was able to get away with a girlfriend, my Swedish friend Karin (hi Karin!) to Cape Town and go a bit wild. Well, okay, slightly wild – we are two mothers with young children after all and one of the best things about the whole long weekend was lounging in bed reading books! But we made sure to make the best of our time in one of the most well-known wine regions of the world, a spectacularly beautiful area with never-ending photo opportunities. Specifically as far as the wine was concerned, we spent a day visiting wineries by way of the Wine Tram tour – and what a wondeful experience it was! We were first picked up from our hotel and shuttled the hour inland to the very attractive town of Franschhoek. Full of pavement cafes and boutique hotels, this town is a must-stop for any grown-ups visiting this part of South Africa. It is the sort of place you could just kick back and enjoy for days at a time, contemplating life through a fine wine haze. The idea is that you take one of the four pre-organised routes between eight different wineries, choosing the five or six you are most keen to visit and simply jump off, stay for an hour, drink some wine, and then hop back on again. Simple! We did worry that after a few tastings we would lose the plot track a bit but the staff both on the bus/trams and at the wineries were obviously well used to slightly inebriated guests and kept us in line. We actually only saw two women who looked like they had probably gone over their limit, as they ran screaming to catch the bus from one stop…. It was a wonderful way to begin the tour and we both agreed that in fact the local stuff (at about a third of the price) was every way as good as the imported French Champagne. Definitely on my list for future purchase! After a pleasant hour at La Lude we made our way back onto the bus along with a large bunch of jolly South African women who we bumped into on and off throughout the day as they chose different wineries to us for their tastings. As well as the wine, the views are the star of the tour – although I can imagine it would be even more stunning during the wetter months (everything was a bit brown and bare at this time of year – but on the plus side, we had beautiful sun and clear blue skies and it wasn’t too stifingly hot). After a bit of food and three more tasters of wine, it was on to the next stop: La Bourgogne. Everything was getting slightly hazy now but this one was memorable for a sweet garden and a couple of friendly dogs who joined us as we took some coffee and cake along with – yes – more wine. Well, it was part of the deal, why wouldn’t you (the tour included two free tastings, plus some at half price and another tasting was free because we bought wine). By this time the weather had started to really heat up so it was quite a relief that the next stop was inside the relative cool interior of the La Couronne winery where we partook of our second free tasting. My main memory here is that our host was a man called Budha – and yes, apparently that was his birth name and not a nickname! At this point we were finally able to get on the actual tram! In the end we weren’t on it for very long and I seem to recall there was a tractor involved at some point as well but it was a fun experience so sit in this vehicle for the short trip to our next destination: Rickety Bridge. All in all it was a great day out and a really wonderful way to try several different types of wine without having to worry about driving. We also really liked the fact that we were basically independent and didn’t feel too herded around as you are on some tours – and could chose which wineries we wanted to get off at. So finally I have reached the end of my Cape Town photos! I had so many I didn’t want to jam them all in to one post. Or two, or even three…. But this is the last one, I promise you! And in good time too as it won’t be long before we’re off again on another adventure…. This picture was taken in Camps Bay, a magificent stretch of beach, backed by the glorious mountains and lapped by the clearest blue icy sea. It was a gorgeous place and the children paddled, ran, climbed, and rock-pooled with glee while I snapped this picture of a cute mummy goose and her goslings. I just thought it was funny that the geese were swimming in salt water. Is that normal? I don’t think so! Another place we enjoyed visiting was Hout Bay, a fishing town round the corner somewhere from central Cape Town (I never did really get my bearings while we were there). We had been told that the best fish and chip shop in South Africa was in Hout Bay – a rough-and-ready place called Snoekies, where you imagined the fish was bought straight in off the boats. The fish certainly was good – as were the chips. But sorry, it still wasn’t as good as our fish and chip shops back home. And what is it with the ketchup here – next time, I’m bringing my own bottle of Heinz! To read my other Cape Town posts please go to Kirstenbosh Botanical Gardens, Penguins and Whales, and Table Mountain. We had no idea what to expect in terms of queues etc when we arrived at the bottom of the mountain on a sunny Sunday morning, about half an hour before the cable car that takes you to the top was due to open. There are other ways to get up there – namely, walking. And had our children been a little older and a little less moany this is something I would have loved to have attempted. But given we were dealing with a pair of seven-year-old legs and a ten-year-old who will run around a football pitch for hours on end but whinges on a ten minute stroll to the shops, we decided the electric version was the only way up. So after a relatively short wait in the line along with a motley collection of tourists from around the world (it feels strange being amongst tourists – this isn’t something that really happens in Pretoria), we bought our tickets and got into the round car. These cars are huge – I think each carries 65 people, so although it seemed like there were a long queue, it went down pretty fast. The other thing about the car that I hadn’t realised is that they rotated – at least, the floor rotated but the windows stayed still. Like one of those 1970’s revolving restaurants that were all the rave for a while. Anyway it was great fun and made sure you got to see every view possible without having to move from your spot. Breakfast wasn’t a great success – they had some sort of buffet system where you paid by weight. But quite honestly it took such a long time to go through the process, the food was cold when we eventually sat down to eat. Cold scrambled eggs – not a good thing. We should have just ordered a coffee as there was no arguing with the fact that this must be one of the best breakfast views in the world! Once we had eaten as much as we could face, we had a stroll around the area closest to the cable car. There were plenty of short walks you could do, as well as longer ones, and we made sure we saw the view over the city from every angle. Eventually we tore ourselves away from the views and made our way down the mountain – probably not a bad idea as the top was starting to get a little over-crowded with Japanese and other tour groups…. But Signal Hil wasn’t just about paragliding and stunning views – the foliage at the top was pretty spectacular too. This really is the most photogenic country! We have just returned from a short trip to Cape Town and Hermanus, which presented me with ooodles of opportunities for great photos. I couldn’t decide what to do with these pictures on my blog as there is just too much for one post. So in the end I decided to break it down and do a series of posts. Today I start with Kirstenbosch Botanical Gardens, where we met with some of my long-lost relatives for a picnic last Sunday. 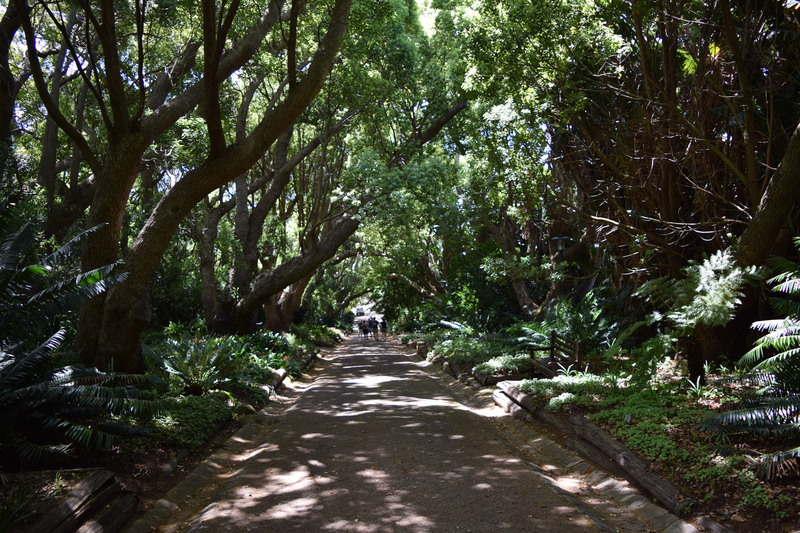 A sun-dappled path in beautiful Kirstenbosch National Botanical Gardens. 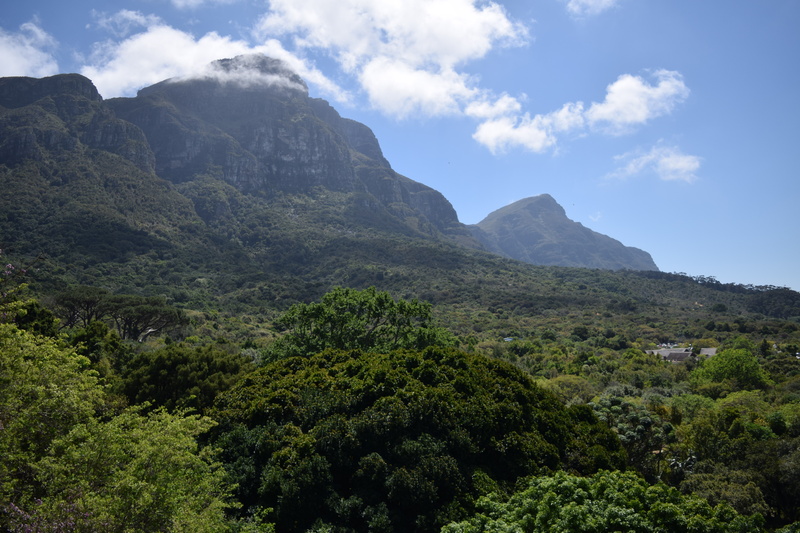 Lying in the shadow of the magnificent Table Mountain, Kirstenbosch is known as one of the most beautiufl botanical gardens in the world – certainly it is one of the loveliest I have ever been to. It is cleverly divided into different areas such as the Useful Plants garden, the Fragrance garden and the Fynbos walk. Grassy slopes, hidden ponds, covered walkways and inviting clmbing trees abound, making the park a perfect destination for familes. 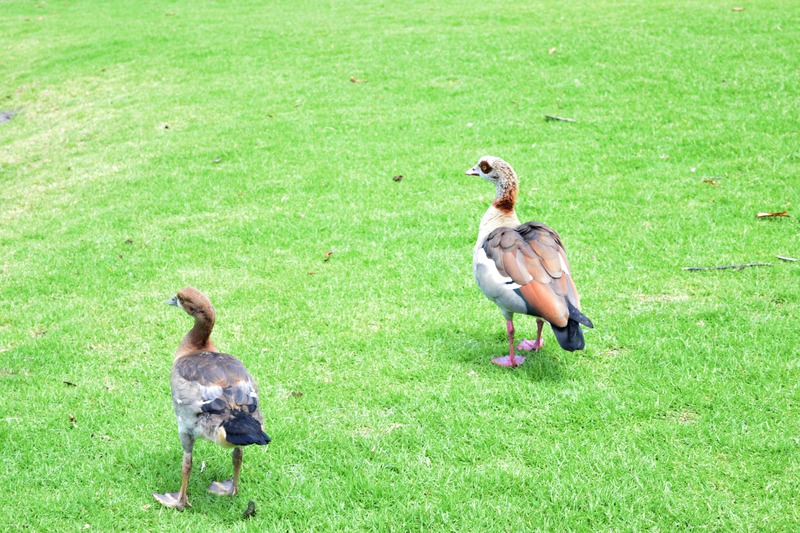 We chose a spot in the shade, with a picnic bench for the more elderly of the long-lost rellies, and based ourselves there while the youngsters ran around, fed the visiting Egyptian geese and generally enjoyed the freedom of an enclosed and safe space. As well as plants, flowers, lawns and trees, the gardens have a wonderful curving tree canopy walkway. Known informally as the “boomslang”, which is the name of a local tree snake, the shape was apparently inspired by a snake skeleton. Certainly it is a wonderful experience to stroll across the gently shaking enclosed walkway, watching from above the antics of the birds and other visitors to the park. There were plenty of areas we did not have a chance to explore, and even as a non-gardener I could see there would be lots of interest here for a good full day trip. 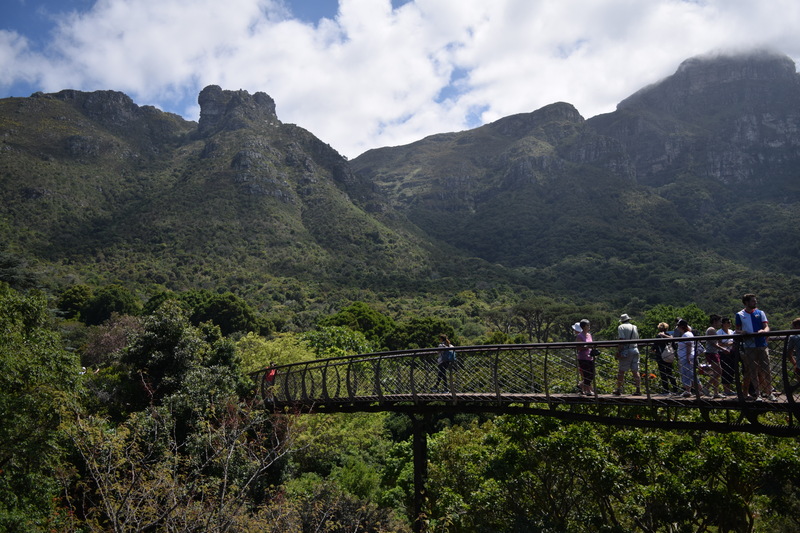 As well as the main body of the park, there are also short walks and longer trails – some of which take you to a waterfall, and you can also start a hike up Table Mountain itself from Kirstenbosch. You must however take your personal safety and security into consideration if you do this – the garden’s website includes safety guidelines. All in all, I would thoroughly recommend a visit to Kirstenboschi if you do find yourself in Cape Town. It’s a beautiful respite from the more hectic city life and a great way to unwind after sightseeing, touring, business, partying – or whatever else brings you to this part of the world.